Social Media Marketing - Is It Really Worth The Hype? | Business Article | MBA Skool-Study.Learn.Share. Social Media Marketing - Is It Really Worth The Hype? Social media is creating a lot of buzz today. At one end we have brands like Starbucks, Volkswagen etc. running great campaigns in the social media space and on the other hand we have companies like GM who are pulling out of the social media space as they don’t see any benefits out of pursuing a social media campaign. So why are brands so keen on establishing their presence in the social media? Recent research as quoted in the “Journal of Consumer Marketing”, Volume 27, Issue 5, social networking is word-of-mouth marketing via the internet. Recent research suggests that word-of-mouth referrals have “substantially longer carryover effects than traditional marketing actions and produce substantially higher response elasticities”. Time spent watching television is unchanged while time spent social networking has grown 93 percent since 2006. Advertising on social media also costs less as compared to the other traditional media of advertising. Though there are always risks of negative comments from consumers on social media, it is useful for listening, talking, energizing and supporting consumers. Also, by employing very few people, you can potentially reach hundreds and thousands of customers in a very short period of time. Besides, you can understand your changing consumer perceptions and trends in real time. Social media also offers the benefits of handling customer queries and complaints and resolve them as quickly as possible. The customer purchase decision process always talks about a number of brands being in the consumer’s awareness set which get narrowed to a few brands in the consumer’s consideration set. In the new era of social media, consumers constantly evaluate brands and add or remove brands from their consideration set and also share their experiences online. Therefore, it becomes necessary to always engage with your consumers through social media to influence this consumer decision process. Social media is one such platform which helps build such engagement. 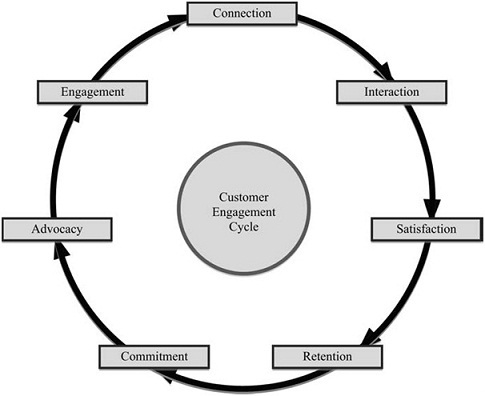 As per a research article on consumer engagement penned by Mr. C. M. Sashi, the consumer engagement cycle consists of 7 stages as shown in the figure below. The connections may be established using both traditional offline methods like salespersons and new digital online methods like social networking. Social media greatly facilitate the establishment of connections with a large number and wide variety of individuals and firms. 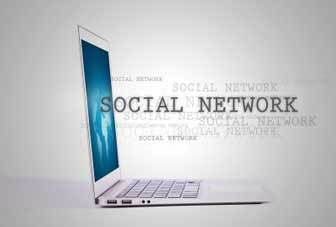 Social networking enables more frequent, faster, and richer interactions among much larger groups of connected individuals and organizations or communities. Sellers can play an active role in the formation of these communities using social media supplemented by the tools traditionally used to serve customers. Interactions among sellers and their customers can improve understanding of customer needs, especially changes in these needs over time, and facilitate modifications to existing products or the development of new products to better satisfy these needs. Only if interactions between a seller and a customer, or among the members of a community including seller and customers result in satisfaction will they stay connected and continue to interact with one another and progress towards engagement. Retention cycle shows the long term repurchase that happens between buyer and seller without the buyer having any emotional attachment with the brand. Commitment results from trust and reciprocity in the relationship of the consumer with the brand. Delighted customers may keep their delight to themselves or in a connected world interact with others in their social networks to spread the word about their positive experiences with a product, brand, or company. When delighted or loyal customers share their delight or loyalty in interactions with others in their social networks and become advocates for a product, brand, or company, the foundation has been laid for proceeding to the next and perhaps most important step in the cycle, customer engagement. Both customer delight and customer loyalty are necessary for customer engagement. Customer engagement expands the role of customers by including them in the value adding process as co-creators of value. Facebook is ideal for the promotion of B2C companies and products. Facebook is not very effective for B2B companies and for pushing corporate announcements. Usually fun/engaging content goes easily viral on Facebook while direct brand related communication does not get much attention. Only moderate level of traffic can be generated to the brand/company site as it will attract only people who are interested in your profile. Twitter is ideal for News websites, Blogs, Press Releases and for Opinion Leaders/Experts. Therefore Twitter can be used for promoting both B2C and B2B companies. Usually both fun and serious posts can go viral provided that they are unique and interesting. Through constant and vital tweeting, brand awareness would be certainly enhanced. There is a fair amount of potential to garner traffic to your site, but it depends on how you promote or sell your website on Twitter. Twitter is a practical and useful way of disseminating information of your organization online. YouTube allows both users and companies to create channels and upload their videos. Since video marketing is ideal for promoting almost everything, YouTube can be used both by B2B and by B2Ccompanies. So, is social media marketing sustainable in the long run! We say, definitely! This article has been authored by Priyanka Pandit from SIBM Pune.